Here in Park City, the weather is starting to get colder, the days shorter, and the mountains are turning a rainbow of reds, oranges, and yellows. As it cools off in the coming months, there is no better way to warm up than with a bowl of hot, delicious soup. Most soups are easy to make and can be thrown together in a matter of minutes. 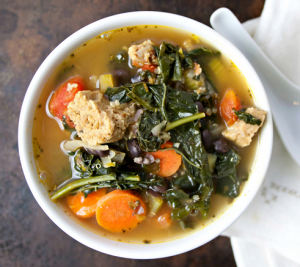 To help prepare you for winter and fall we have compiled a list of 10 healthy fall soups. All recipes were taken from Pinterest, our go-to recipe hub! Follow us to keep updated on recipes, fitness routines, and resort news! 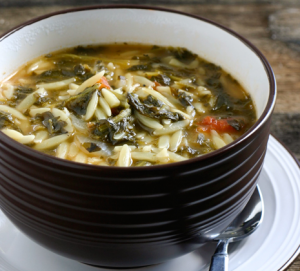 Featured in SELF magazine, this recipe is perfect for any chilly, rainy day. It is packed with thickly cut veggies, making it more of a stew than a soup. Although this one is a bit more time consuming than the other recipes we have listed, it is definitely worth it. With a variety of vegetables, you won’t have to worry about a guilt trips after you finish your bowl! Ever have one of those days when 6:00 rolls around and you have no idea what you are going to make for dinner? 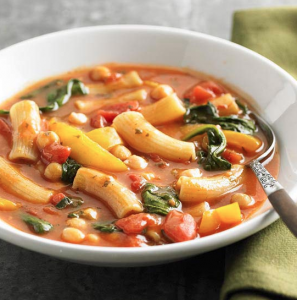 This vegetarian soup is a perfect option for those desperate times. It uses items that most people have in their pantries at all times. Another bonus is the fact that it can be prepared in 15-20 minutes. If you don’t have orzo pasta, use a whole-wheat version of your personal favorite. 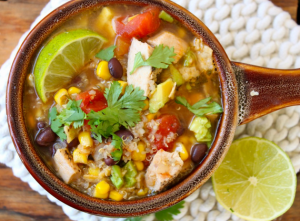 Taco soup is a delicious way to enjoy a hearty, Mexican style dish at a fraction of the calories. By substituting turkey for beef, and using fat free low sodium chicken broth, you can enjoy a filling soup without feeling like you need to hit the gym the second after you finish. If you want a thinner soup, add more broth. 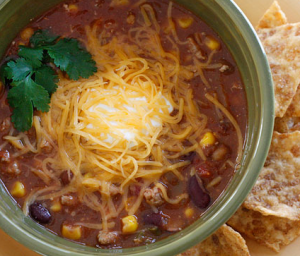 For chili, ditch the broth completely! 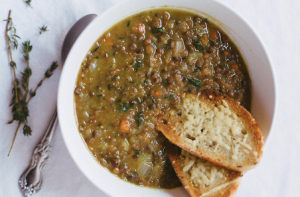 We agree with the author on this one; lentil soup is something that everyone should have a recipe for. It’s easy to make, extremely nutritious, and best of all, super cheap! The recipe listed is the vegetarian version. If you want to give it a protein punch, add some diced ham or ground turkey. Serve with a slice of whole grain bread and you have a hearty, healthy meal that they entire family will enjoy. Nothing says “fall” quite like squash. Adding squash to a soup will ensure that you have the ultimate fall dinner. The delicious flavor combination is both yummy and out of the ordinary. Prep time is only 20 minutes, and it makes the best leftovers. Our favorite part is the drizzle of light coconut milk added just before serving. It is an interesting addition that gives the soup a hint of Indian influence. Chicken tortilla is another wonderful way to enjoy a Mexican style dish without the worry of the fat and calories. This recipe is super simple and will take you all of 10-15 minutes to throw together. With quinoa and chicken, you will get your daily protein intake, plus the nutritional content of five different veggies! Feel free to make it your own by ditching the chicken and making it vegan! Whatever you do, it’s bound to be delish. This recipe can be made in twenty minutes. It is vegetarian, but chicken could be added in lieu of or in addition to the garbanzo beans. It is extra delicious served with a slice of whole grain bread. Did we mention that at just 234 calories and $1.53 per serving? It is easy on your wallet as well as your waistline. You can’t beat that! We love this dish because of its versatility. If you don’t have spinach, use kale or mustard greens. Although it calls for beef sausage, we recommend opting for a chicken or turkey sausage to lessen the calorie density. Although it is a great dish on its own, it is also great as a side. 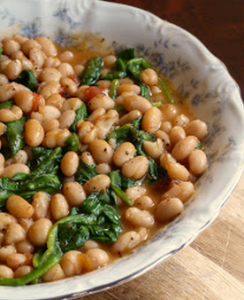 If you are vegetarian, go without the meat altogether and double the beans instead! 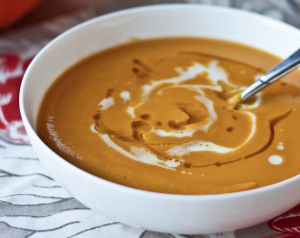 We couldn’t make a list of fall soups and not include one that uses pumpkin in the ingredients! 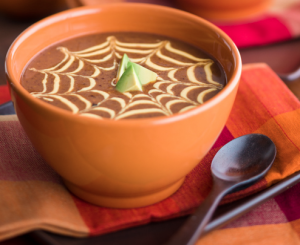 This black bean and pumpkin soup is a delicious, less-traditional version of pumpkin soup. It has a smoky flavor with a spicy kick. It is great as a main dish, or paired with a whole-wheat chicken filled tortilla. If you are planning to host a Halloween party this year and hope to impress your guests, we suggest this dish. Don’t forget about the web design for the final touch! 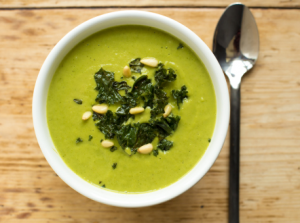 We love this recipe not only for the unlikely flavor combination, but also because it ends up being a gorgeous green color that you won’t get from any other soup. It has a delicious flavor and a creamy, velvety texture. We know once you try this, it will be a fall/winter favorite for years to come!